We've set the standard at natural health events. Working alongside leading chefs at top venues, we ensure our food leaves an impression long after the last attendee leaves. For natural and organic food and drink brands we ensure they enjoy maximum exposure to gain a foothold where it matters. After 16 years of successful postgraduate educational development in the USA, The Institute for Functional Medicine in cooperation with Clinical Education has been delivering its intensive 5-day training to the UK since 2011. Over five days, attending practitioners undertake extensive training in how the principles and philosophy of functional medicine can be used to prevent loss of function, disease and maintain the health of their patients. Renowned and experienced clinicians and practitioners take on the course to incorporate leading edge science and introduce new and evolving investigation methods into their practices. 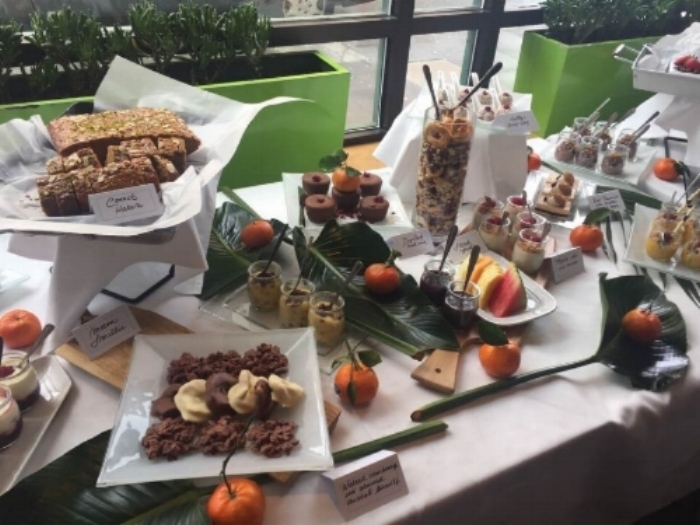 A 'free-from' feast of desserts minus gluten, dairy and refined sugar at the 2017 AFMCP-UK, Millennium Gloucester Hotel, London. As consultants to AFMCP-UK™ we are very proud of the reputation earned as setting the industry standard for creating delicious and nutritious menus at that reflect lecture content across all five days. Since my team and I first introduced the AFMCP-UK™ Food & Drink Awards back in 2011, we are thrilled to watch them grow alongside IFM’s foundation training programme and become the highlight they are today. The awards have helped shine a light on natural and organic product producers at all stages in their growth cycle and provided incredible exposure to natural health practitioners. Our approach and feedback from very satisfied delegates about the incredible daily showcase of culinary delights has even influenced the catering approach for much bigger IFM events on US home soil. We’re thrilled that in the UK we can make such an impact and we intend to carry on innovating for AFMCP-UK™ 2018. Proud 2017 Food & Drink Award winners (from left to right): Coconut Collaborative (Best Food); Pukka (double winners with Best Drink and Overall Supplier of the Year); Osius Bone Broth (Most Supportive Approach to Nutrition Health Professionals). Adele has provided sponsor management and catering oversight and development for our 5-day training conferences since 2011. Applying Functional Medicine in Clinical Practice has at its core the role of food and nutrition in the generation and restoration of health. As such we have engaged with Adele and her team to generate compelling lecture orientated meals and breaks, ensuring the attendees experience food in action and exposing them to novel ingredients and suppliers. Without question the food, and menus are discussed by the attendees for months afterwards, and differentiate further our educational programmes. Adele presenting the AFMCP-UK 2017 Food & Drink Awards. Hilton Metropole Executive Head Chef Nigel Frost and his team receiving an award for catering excellence at AFMCP-UK 2012. "It is a pleasure to work with Adele. Her passion for what she does ensures that all aspects of the events we work together on are a success. Adele has eye for detail and executes everything she does with creativity, always providing bespoke solutions for every event we work together on. Adele added a lot of value to our events by introducing us to natural food brands in their early growth stages. Creating the Awards feature for these small brands made the break times a real talking point and gave much appreciated exposure for the foods. Adele has set the benchmark for practitioner training events - her menus and catering options are nothing short of excellent and keeping 300+ nutritionists and healthcare professionals happily fed is no mean feat! I would not hesitate to recommend Adele for any aspect of what she does and I am looking forward to working with Adele on many more events in the future." “Thank YOU Adele Wolstenhulme! Every lunch, break, snack and desert was flawless! I have been a little disappointed to go back to hummus in buckwheat crackers with a little cucumber for excitement, not quite the same! Adele was delighted with the feedback from practitioners and general public who attended her first event in London in 2010. A few of our expert speakers (Benjamin Brown ND; Dr Marilyn Glenville and Philippa Levinson DipION) answer key questions from the audience at the end of the day's proceedings. Chronic stress is now one of the biggest problems impacting healthcare systems across Europe. But how do we know when to take our foot off the gas and slow down? Apparently we don’t. Adrenal fatigue has become the 21st century condition. But how many of us connect daily niggling symptoms of aching muscles and joints, brain fog, irritability and insomnia, fatigue, anxiety and depression to ‘lifestyle-induced stressors’? Lifestyle-related stress needs lifestyle-related medicine. At Profit from Your Health we can provide you with the necessary education to recognise the sources, early signs and symptoms of chronic stress. Our aim is to inspire and motivate you into making simple changes to help future proof your health well into old age. So invest in yourself. You are worth it. Our keynote speaker and Olympian Anna Hemmings MBE inspired the audience on her battle to overcome chronic fatigue syndrome, and how she added to her gold medal tally AFTER she got over her illness to become 6-time World Champion in her sport. Highlight from 6x World Champion canoeist Anna Hemmings on chronic fatigue. Dr Dorian Dugmore advises on 'knowing your numbers' for heart and cardiovascular health. Highlights from Dr Dorian Dugmore 's presentation 'Heart health4Life', where he uses examples of Football Premier League managers and the serious effects of stress on heart health. Business psychologist and Profit from Your Health Associate Sue Firth, on 21st century stress. Dr Mariliyn Glenville gives her thoughts on a day packed with take-home tips to manage stress. Ben Brown ND got into the detail on 'The stress continuum: anxiety, insomnia, depression and burnout'. Highlights from naturopath Ben Brown's presentation on 'The stress continuum: anxiety, insomnia, depression and burnout'. Philippa Levinson's* take on the day's proceedings after educating the audience on 'Toxic stress'. Highlights from her presentation 'Toxic stress: the detox antidote for life' - nutritionist and detox expert Philippa Levinson DipION. * Philippa Levinson is now working as a mindset and empowerment coach with business women.